The new OnePlus 6 comes with big improvements over the company's previous models: an all-new, glass-and-metal design, an edge-to-edge, notched display, and a top-level spec sheet at a price much lower than other flagships. It’s the perfect disruptor of mainstream phones. And when we speak about mainstream Android phones, there is one that stands tall above all others: the Samsung Galaxy S9+. The Galaxy is the single most popular top-tier Android phone, the one that all others aspire to dethrone: it has a gorgeous Super AMOLED screen, a refined design, best-in-class camera and a feature-rich interface. But Samsung’s Galaxy formula is also one that has not changed much throughout the last few years, and OnePlus knows there are dents in its armor. So… it’s time to put these two top dogs in a direct, one-on-one fight to determine the winner. We compare the OnePlus 6 against the Samsung Galaxy S9+, looking at the big picture and the smaller details that could make a big difference in the daily grind. Let’s get started. Two incredibly well designed glass phones. Samsung has gone through a major transformation when it comes to its designs: gone and forgotten are the plastic Samsung phones from the past. Over the last few years, the company has been making stylish, refined, high-class devices out of glass on the back and the front and with a sturdy metal frame in the middle. The Galaxy S9+ is its most refined design to date, with subtler curves, slimmer bezels, a more conveniently positioned fingerprint scanner and so on. But design success leaves obvious clues, and OnePlus is quick to pick on those: the company has watched and learned, and the new OnePlus 6 is every bit as well thought out as the Galaxy S9 series. The OnePlus 6 is big, so it’s more comparable to the Galaxy S9+, and it has Gorilla Glass 5 on both the front and the back as is the trend these days. 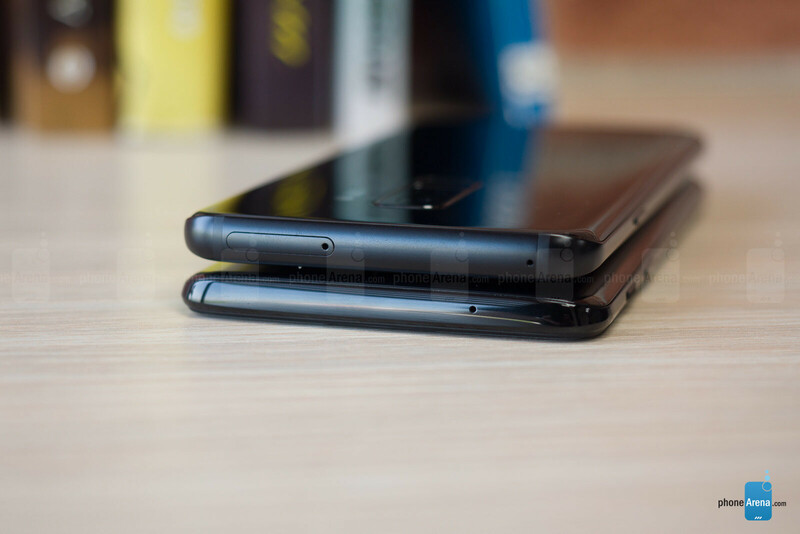 The back glass here has a slight curve to it that makes the phone more comfortable to hold, a nice little touch. But here is one place where the OnePlus 6 has an advantage: diversity. 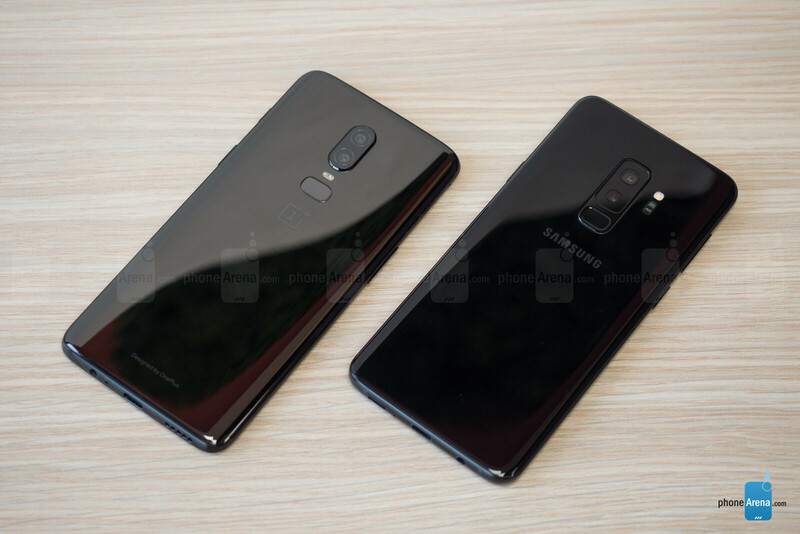 You only have one style of the Galaxy S9 (you do get various color options, though), while with the OnePlus 6 you have the Mirror Glass glossy OnePlus edition that gets easily stained with fingerprint smudges, just like the Galaxy, but then you also have the Midnight Black matte edition that not only has a very distinct, pleasing tactile feel, it is also much more practical, as you can use it without a case and not worry about finger smudges. Both phones also keep the good old headphone jack that allows you to connect wired headphones without any clunky adapters. 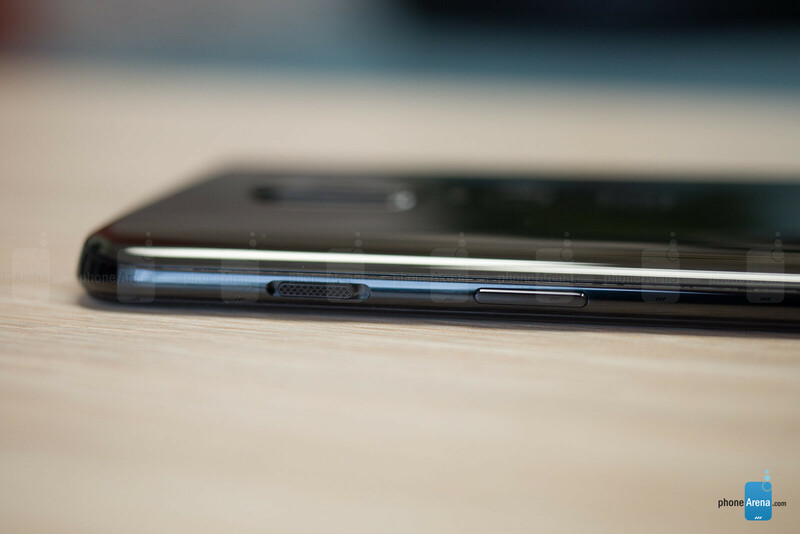 It’s also worth noting that both Samsung and OnePlus paid attention to even the little details: things like the physical power and volume keys on the sides are extremely well crafted, with just the right amount of click and travel. Speaking of buttons, the OnePlus 6 has one toggle that no other Android phone has, and OnePlus calls it the Alert Slider. It’s a 3-position toggle that OnePlus has made simpler – it allows you to quickly switch the phone from Ringing mode to Vibrate-only and to a completely Silent mode. The Alert Slider is an even better solution than a simple mute switch, and we do wish more Android phones had something similar. The Galaxy, on the other hand, has its own unique button that other phones lack: the Bixby key. Unfortunately, Bixby, Samsung’s take on a voice assistant, is not quite as fast, knowledgeable and cannot quite recognize voices with the same accuracy as the almighty Google Assistant. And you cannot change this button to open anything else! So yes, for most people, the Bixby button will be more of a distraction rather than a useful addition, but it’s still there. Finally, we ought to mention one more thing about the practical side of the design of these phones: the Galaxy S9+ is water-resistant and it’s certified to the IP68 standard, meaning it can withstand being submerged in water up to 5 feet deep for as long as 30 minutes without suffering damage. The OnePlus 6 only has partial water protection: it will survive a rain or a short drop in the sink, but you definitely should not keep it in water intentionally. Face unlock is the new hot topic when it comes to a secure way to unlock your phone, and we’re happy to say that both the Galaxy and the OnePlus support the new technology. However, face unlock on these two phones is still not as secure as a fingerprint scanner, and it’s not as advanced as the 3D-mapping, AI-infused Face ID tech that Apple bakes in its iPhone X. Still, in many cases, especially during the day, face unlock on the Samsung and the OnePlus works quickly and reliably, and we would definitely consider adding it as a second option to fingerprint scans. With this in mind, it’s clear that fingerprint scanning is still the most secure, fastest and most practical way to unlock your phone. Unfortunately, Samsung has had some disappointing issues with the fingerprint scanner on the Galaxy S9 series. For many users, the fingerprint scanner on the S9 or S9+ would simply stop working in the middle of the day for no reason. In order to get it back to working order, you need to restart your phone, which is a hassle. The issue has been reported to Samsung and the company is allegedly working on a fix, but at this moment, the fingerprint scanner experience on the Galaxy S9+ has been a let-down for many. Luckily, the OnePlus 6 does not have such issues and its fingerprint reader performs admirably quickly, unlocking the phone in under 0.2 seconds. Good job, OnePlus! Two AMOLED screens, one big difference. Both Samsung and OnePlus are committed to using AMOLED screens for its high-end phones, and for most people, this is great news. 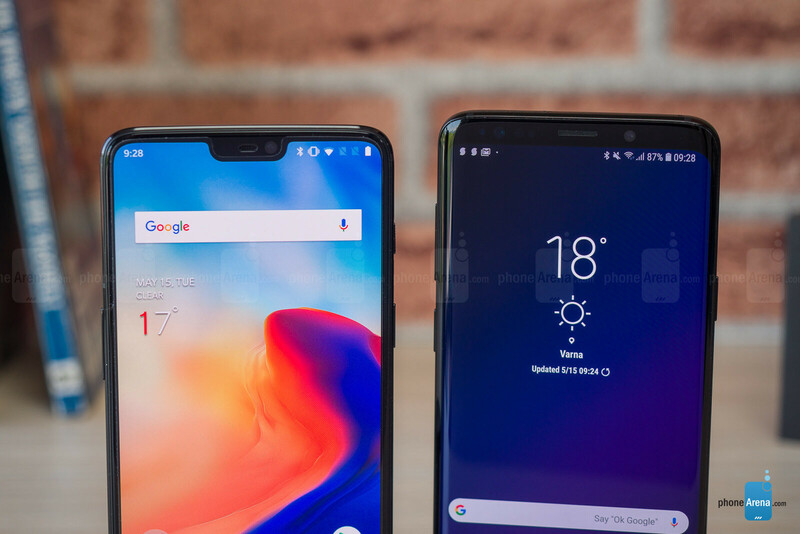 The OnePlus 6 features a 6.3-inch screen with a notch and a 19:9 aspect ratio, while the Galaxy S9+ sports a 6.2-inch display with a tiny bezel, but no notch, and it’s got an 18.5:9 ratio. 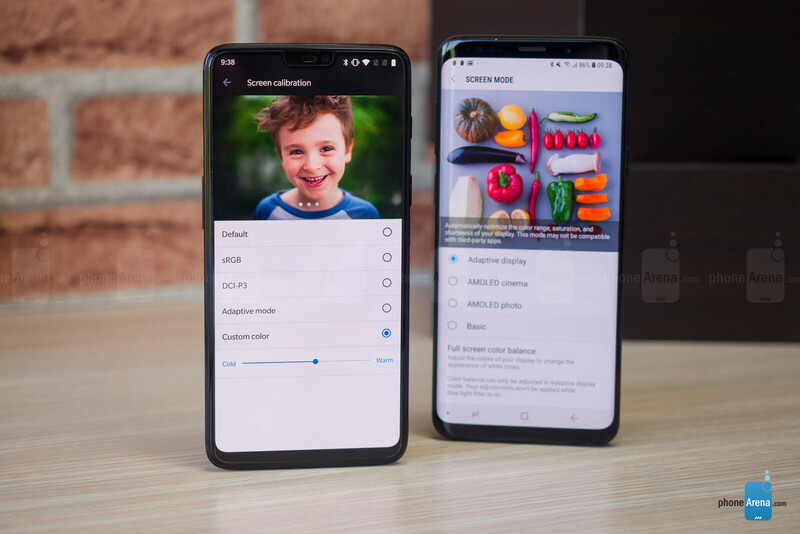 You do notice there is a difference in resolution and sharpness between these two phones, as the Galaxy is the sharper phone, but keep in mind that the S9 has three different resolution settings and by default, it’s also set to Full HD resolution. The screen isn't as sharp as it can be, but it should be sharp enough for most people while also performance and battery life a boost. When it comes to the notch on the OnePlus 6, you really get used to it quite quickly. After a while, you realize that it is the compromise that allows you to have a larger screen-to-body ratio, so we don’t mind it. Plus, OnePlus offers the neat option to hide it if it annoys you. What really matters for a screen these days, however, is something different: a screen is only as good as its colors.In the case of both, the OnePlus and the Galaxy, the displays are set to display some very rich, punchy, overblown colors that impress, but do not quite convey a realistic picture. Both phones also offer more balanced color modes in display settings, and we recommend trying them out to see if those look better to you. The biggest difference between these two screens, however, comes in one aspect that not many people have noticed: screen brightness. Both phones support automatic screen brightness, but the OnePlus 6 is very conservative with its selection of automatic brightness level. What does this mean? Well, in simple terms, it means that the OnePlus 6 display is too dim! We don’t know whether this is done on purpose, to help with battery life, or for some other reason, but the result of this decision is that colors lose their vibrancy, and pictures you see on your phone look lackluster. We have noticed this issue in previous OnePlus phones as well and it persists here. To confirm this, we compared the OnePlus 6 display against the Samsung Galaxy S9+ in the same spot, in the same room, both set to automatic brightness and we found that on average, the Samsung screen was some 50% brighter in the same conditions! That is a huge difference, and yes, it is a problem that we have only noticed on OnePlus phones and not on any other phone out there. We hope OnePlus listens and allows for more control over auto brightness in the future. If not, Android P has promised to bring auto brightness improvements when it arrives. OnePlus is all about that clean look and speed, while Samsung sacrifices speed for visual flare. We’d take the speed, thank you. Both the OnePlus and the Galaxies run on Android 8 Oreo, but they have a very different approach to customizing Android, and this results in some big differences in the actual user experience. OnePlus’ custom interface is called OxygenOS and it’s a clean UI that in many ways looks like stock Android. It comes pre-loaded with only the essential apps (mostly Google-made apps) and, thankfully, has no bloatware. OnePlus has said that it focuses on things that really matter like speed improvements with over 200 tiny enhancements under the hood, and this really feels like one super fast phone. The Galaxy, on the other hand, has the Samsung Experience interface (formerly TouzhWiz) on top of Android, and this UI transforms the stock Android experience hugely. On a positive note, the Samsung Experience adds some useful features like Knox security and Secure Folder just to name a few, but on the downside, it also seems to be too heavy with a slight, but noticeable stutter that you see everytime you try to open an app. The biggest new feature in the OnePlus 6’ interface ought to be the new gesture navigation. This is a setting that you need to explicitly activate, and while it is not perfect, it gets rid of on-screen navigation buttons and makes for a cleaner experience. You don’t have such an option on the Galaxy and you still need to rely on on-screen buttons, an experience that is not quite as fluid. An interesting feature that the Galaxy S9 supports and OnePlus does not is the ability to connect to a larger screen via the DeX dock accessory. Place your Galaxy on the separately purchased DeX dock, connect it to a large-screen monitor and it will work as a desktop computer, allowing you to do work on the big screen. While the experience is not as fast as on a dedicated computer, some people will appreciate having the option to work on a big screen using nothing but their phone. Same Snapdragon 845 chip, different performance. 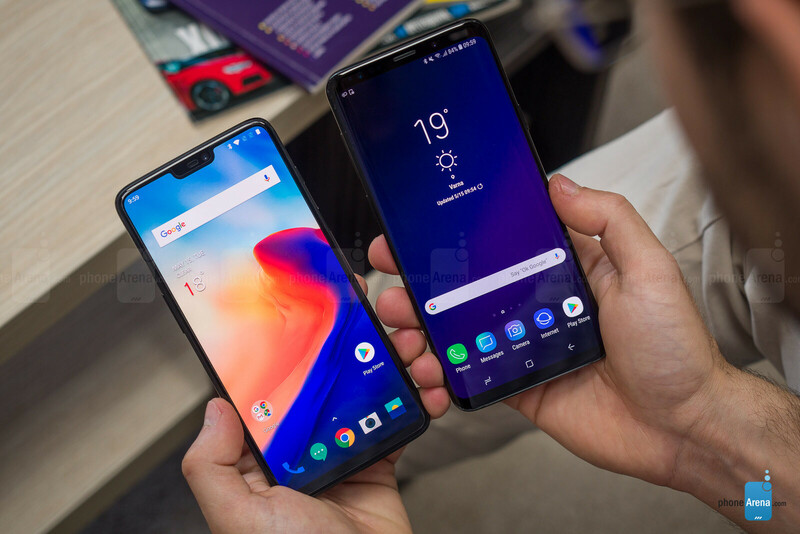 In 2018, most flagship Android phones come with the Snapdragon 845 system chip, and the OnePlus 6 and Galaxy S9 series are no exception. 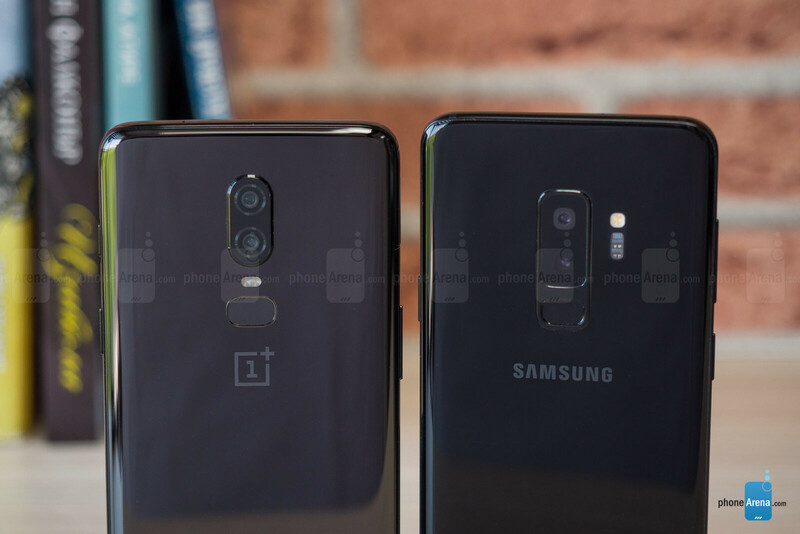 The phones differ slightly in their configuration as the OnePlus 6 is offered in three models: a 64GB storage/6GB RAM one, a 128GB/8GB RAM and a 256GB/8GB RAM ones, while the Galaxy S9 and S9+ are sold in a single, 64GB version with 6GB of RAM on the S9+ and 4GB RAM on the S9. But the difference in performance here largely comes from software. We’ve already told you about the slight, but noticeable stutter on the S9+, a thing most likely due to software as the equally fast OnePlus phone does not have it. In terms of storage, the OnePlus phone does not support a microSD card slot, while the S9 and S9+ both have a microSD card memory expansion option on their side. OnePlus has really stepped up its camera game. These days, a camera can make or break a phone, and with the OnePlus 6, you have one of the best cameras the company has ever made. 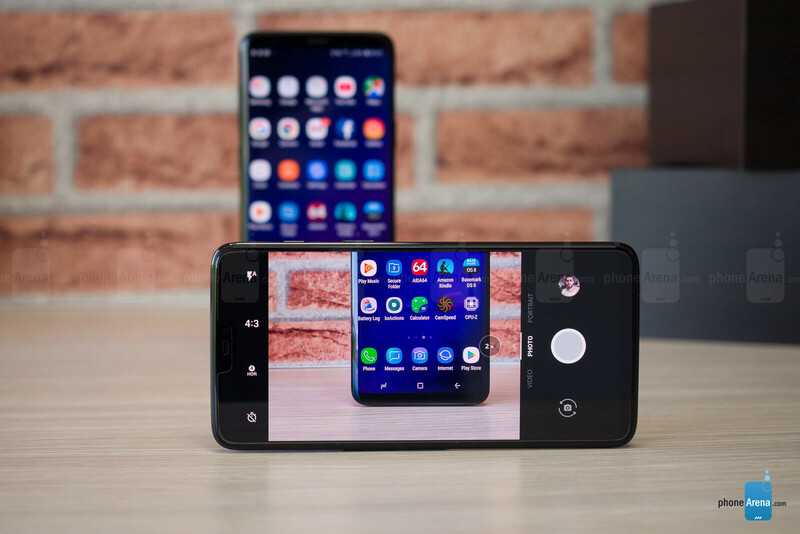 On the back, the phones has a dual camera system with a main, 16-megapixel camera and a secondary, 20-megapixel shooter that enables portrait mode shots with a blurred background. The main camera can also shoot 4K60 and 480p slow-motion. The S9 and S9+, on the other hand, come with a variable aperture that can switch between F2.4 for brighter environments and F1.5 for low-light scenes. This allows the S9 and S9+ to capture more light when needed. The S9+ also has a secondary camera, a telephoto shooter that allows you for 2x lossless zoom and for portrait shots that Samsung calls Live Focus. So… which phone takes better-looking pictures? Except for the more noticeable oversharpening artifacts, everything else easily goes into the bucket of “nitpicky” complaints. These two cameras perform great, and this is what really matters. But here is the thing: there is also a big difference in the way you see media on these two screens. The conservative auto brightness default OnePlus setting makes the screen appear very dim, which strips a lot of the shine off the OnePlus’ shots when you view them on the phone screen. Images just look better when you go through them on the Galaxy. When it comes to the front camera, we have a 16MP front shooter on the OnePlus 6 and an 8-megapixel front cam on the Galaxy S9 and S9+. In daylight, the differences are not that big between these two and both are very good performers, but in slightly lower light the Galaxies shoot sharper and better-looking pictures with more detail. Both the Samsung phones and the OnePlus 6 can record up to 4K video at 60fps. This high frame rate video appears extra smooth and looks great, but takes up a lot of space, so you might want to stick with 4K30 or 1080p for longer videos. The Galaxy is the one that is faster to focus and is able to hold on tightly to what’s in focus, while the OnePlus is definitely slower to focus and often times can’t keep your subject in focus all the time, which is distracting. Then, in terms of stabilization, the Galaxy does a slightly better job by combining electronic and optical image stabilization. The OnePlus also has video stabilization in 4K, but it is not quite as good as you notice a slight jitter with every step you take. Then, there is slow motion video. You get 480 frames per second on the OnePlus and double that, 960fps on the Galaxy, but actually we find the OnePlus slow motion easier to use as you can record longer intervals and select what part of the video to slow down after you’ve taken it. The short video duration in slow motion on the Galaxy and the fiddly operation definitely steal a lot of the appeal of its slow motion mode. Phones have really stepped it up when it comes to the quality of the sound that comes from the loudspeakers of devices in the past year, and the Galaxy S9 series are a testament to that: they indeed sound unexpectedly great for a phone. In this regard, the OnePlus 6 is just mediocre, and definitely not quite as impressive with loudspeaker that lacks a bit in punch and clarity. 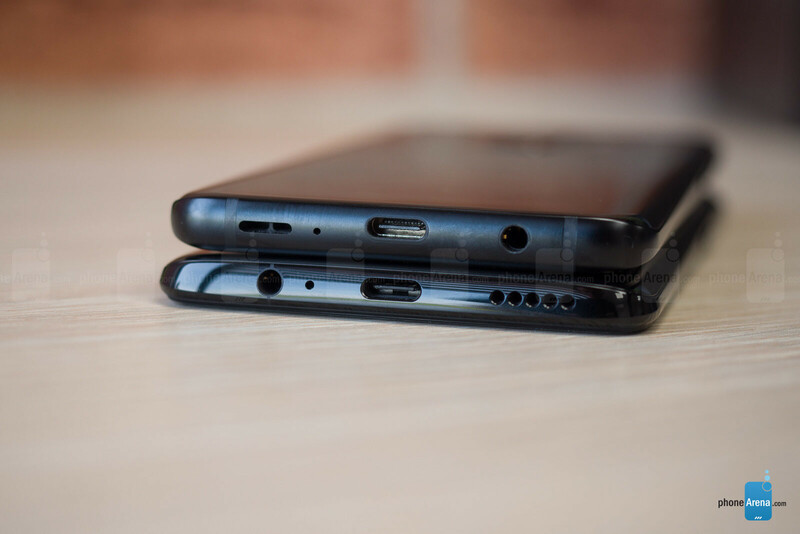 Again, both phones also have a headphone jack, a feature that is quickly disappearing from 2018 phones, and this is a convenience for those who use wired headphones. We’ve had no issues with call quality on either of these phones. All live up to expectations of a flagship 2018 phone and calls come out with good reception and sufficiently loud and clear voice quality. 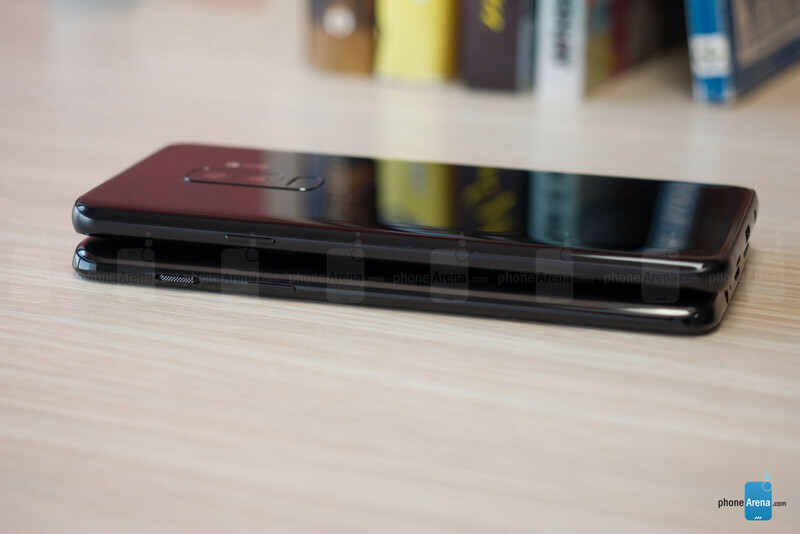 The OnePlus 6 features a 3,300mAh battery, while the Galaxy S9+ ships with a slightly bigger, 3,500mAh cell. We have seen other companies like Huawei push battery capacity on its phones to 4,000mAh and we would love to see this in more phones in the future, but that’s a side note. Comparing the OnePlus 6 against the Galaxy S9+, both get a very decent battery life, but not much more than that. And they are certainly no record setters. In real life, you will likely need to charge both these phones daily. No, you won’t have problems getting through those longer days, but don’t expect more than one full day of battery life. We have also ran our proprietary battery test on these two and you can see how they compare on it right below. Another important aspect of the battery equation is the time it takes to re-charge a phone. Samsung has its Adaptive Fast Charging technology, while OnePlus has its awesome Dash Charge tech. Both are quick charging technologies, but they work differently. The OnePlus charger uses a higher amperage and it maintains fast charging speeds even when you use the phone while charging. The Samsung charger uses a higher voltage and cannot maintain the fast charge speeds when you use the phone. 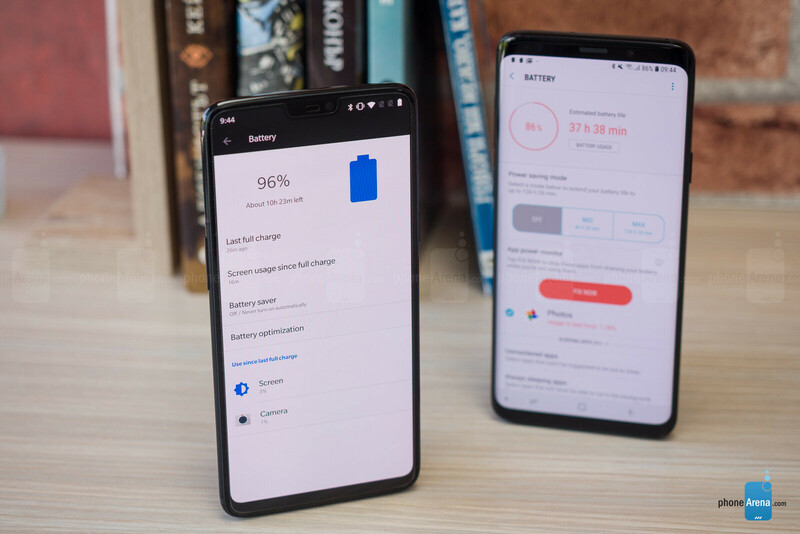 In real life, the OnePlus 6 is the fastest charging phone of the past year or so, charging fully from 0 to 100% in just 1 hour and 20 minutes, while it takes a bit more for the Galaxy to recharge. However, the OnePlus 6 lacks the convenient wireless charging feature that the Galaxies have. Despite OnePlus increasing prices slowly, the difference in cost is still quite startling: the Galaxy costs $260 more, so it has about 50% higher price than the OnePlus 6. Also, if you look at prices outside the US, the difference is actually even bigger, making the OnePlus seem like an even better deal. And that’s great news because OnePlus has really stepped up its game this year with a more elegant design, the useful gestures (they still need refinement, but Samsung does not offer any form of gesture navigation), the improved camera and the speedy interface. Our biggest gripe with the OnePlus 6 is – maybe surprisingly – its screen. And particularly, the very low automatic brightness setting, a thing that you notice more and more as you use the phone. And there are two things we really wish the OnePlus 6 had: proper water-protection and wireless charging. So why should you even consider the more expensive Galaxy then? Well, it is a great looking phone, it has probably the best-looking screen of any phone out there, an excellent camera that is still better than the one on the OnePlus, an impressively well-sounding loudspeakers and a few neat software tricks like Secure Folder and Knox. Oh yes, and you cannot use a OnePlus phone on Verizon Wireless and Sprint. But if you don’t care too much about the last point, the reality is that OnePlus has really made a great phone at about the same caliber as the Samsung Galaxy S9+, but at a much better price. Quite the achievement, isn’t it?
" AI-infused Face ID tech that Apple bakes in its iPhone X " , Why mentioning iphone in every Samsung related review became a standard issue ? Because when we speak about face recognition Apple is the pioneer and most other companies are trying to reach this level of technology. Maybe in smartphones, but I have a Microsoft Surface Pro 4 and it has this tech since 3 years ago - working perfectly. And we are still in sixties, ain't we? You forgot that it's Victor, phonearena's biggest isheep. Leave him be with his false hopes and dreams. Slap the alert slider on the Galaxy series, and you have an amazing device. No need. But it's a nice extra. This is completely off topic, apologies. My mom's two weeks old S8 taking over three hours to fully charge with stock Adapative Charger. Anyone else facing this problem? So basically OP6 spanks the S9+ in all benchmarks and has better batery life and is smaller while having a larger screen, all of these while costing half the money. What more there is to say, really ? That it came out later so it should be better.....in certain areas. You are gasping here, 5 minutes difference in battery, LMAO Fast, go watch videos, they are really close in performance in real life use. S9+ , ip68 1p6, not I will take all the other pros over the 1p6 any day. It's all in what you like and anyone that likes the 1p6 it is a great phone just like the s9+ is. It's so stupid. Android phones have only been using Facial Recognition for less than a year, and Finger Print scanning for barely five years. Android phones have these for so much longer, and they don't get recognition. You could go up to a person in the street and ask them who created facial recognition. They would say Apple. They know no better because they are young people, who use Apple phones. If they used an LG G7, S9+ or One Plus 6, they would be surprised. I would pick oneplus even if it and s9 would have same price. Samsung highly overpriced, you pay for S name on board. I'm using OP6 128GB and S8+. Samsung has literally no competition in Display quality however OP6 has an amazing display too. Camera is pretty close to Samsung and takes amazing pictures. Design is awesome. Battery life is definitely a lot better than Samsung. When it comes to performance, OP6 is probably faster than Pixels while offering more features than stock Android. Fingerprint scanner is very fast. Face unlock, while not as secure, is insanely fast. You can't imagine how fast it is without using it. On top of everything OP6 is 45% cheaper than S9+ here in India. That's great a comparison you've made. I have OnePlus 6 and Galaxy S9 both. In my perspective, the Galaxy S9 feels very luxury whereas, OnePlus device are more of powerhouse like feeling. But I see Galaxy S9 loads tons of bloatware apps, whereas OnePlus doesn't. 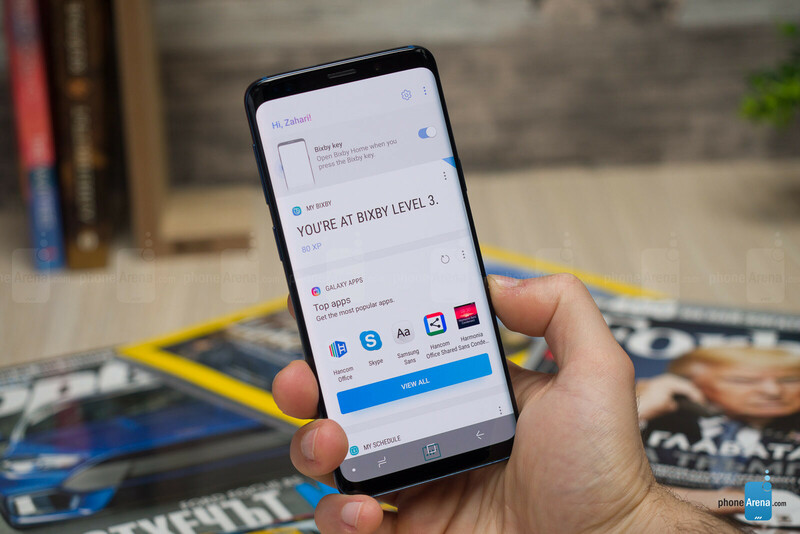 On my Galaxy S9, I've put many third-party apps to replace the native ones, thanks this list:https://techshali.com/top-apps-samsung-galaxy-s9-plus/ And of course, there are most apps to be installed on it. Whereas, the OnePlus device has very minimal apps. There are few Google apps, no bloatware. Both the devices are good in both performance and looks. There is just price difference that makes Galaxy S9 something better! That's my point of view!